Think about the last time you took a walk through the woods or strolled along a lake or ocean. Saw a field of wildflowers while stuck in traffic on the freeway. Chances are you weren’t thinking, “Wow, this tree doesn’t match that one.” “The colors of the sunset clash with the water.” “That flower looks out of place.” It’s because the best colors, textures and patterns come from nature. That’s where we take our design cues. We use natural materials and nature-inspired colors in our furniture because they easily mix to create a cohesive space. Take a look at some high-mix, low-mix materials in these living rooms, dining rooms and bedrooms. Our Design Associates often suggest choosing a rug for the room first (to set the tone), and let the furniture follow from there. The Safi rug has so many earthy tints that it’s easy for different fabrics and leathers to pull from it and feel tied together. 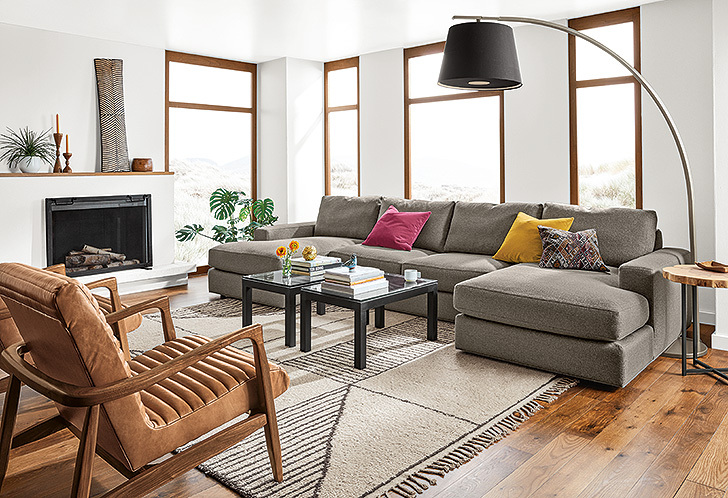 The Beckett sectional pairs a unique U-shape design with a neutral grey fabric, allowing the throw pillows and bright cognac leather on the Callan chair to pop. The natural steel-based Streeter floor lamp, Parsons coffee tables and Allard end table give this room a consistent material that doesn’t feel overbearing. Tip: if you’re working with a lot of materials, glass will always make a space feel less dense. 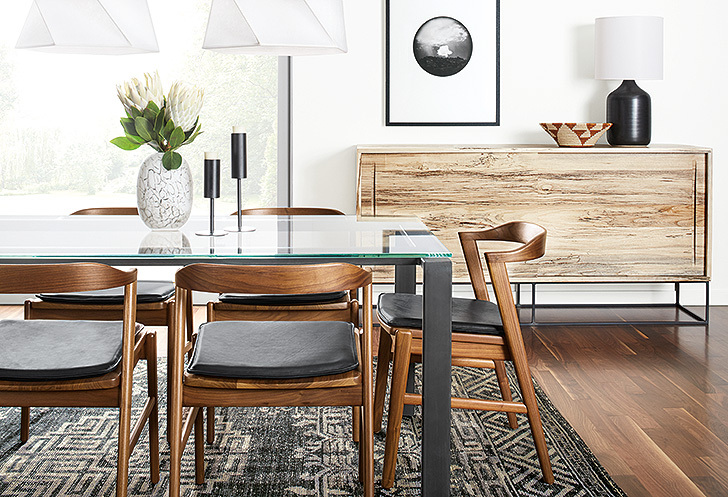 Opt for glass tabletops if it feels too cluttered. The low and long Keaton media cabinets form the backdrop for this low-mix living room. 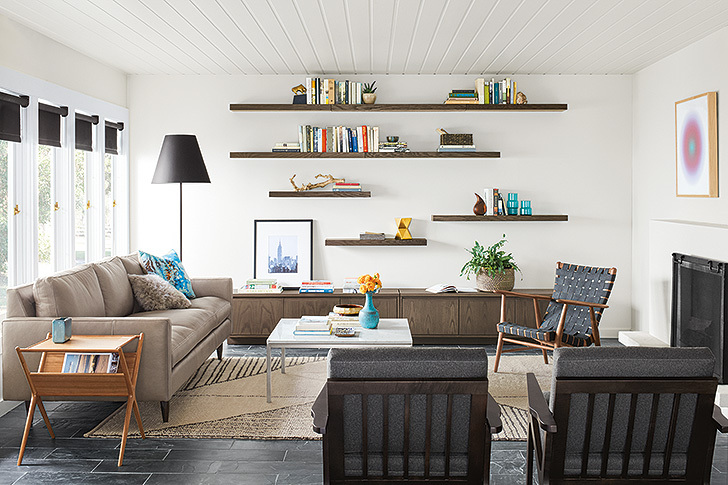 The bark stain is echoed by Float wall shelves, making their way up the wall to provide plenty of room for books, plants and more. The Jasper sofa, Ira chair and Sanna chairs all play to a grey color palette, unifying the look of this room. And making room for a warm wood – the Fitz end table in cherry adds brightness to the space. Tip: Leather will always look and feel neutral. It’s a great base for a room if you’re mixing materials. A statement storage piece and a patterned rug in tight quarters? Absolutely. The high contrast of the Steen dining cabinet and Amira rug are offset by other neutral pieces and a mix of natural steel throughout the space. The natural steel legs on Steen and the Rand dining table pair back to other small items, like the Lucent candle holders. The glass top keeps this room from feeling too busy and lets you see the beauty of the rug underneath. Tip: Woods are easiest to mix! The natural grain patterns of all types of wood are naturally meant to go together: that’s why the walnut Jansen chairs and sugarberry Steen play so nicely. 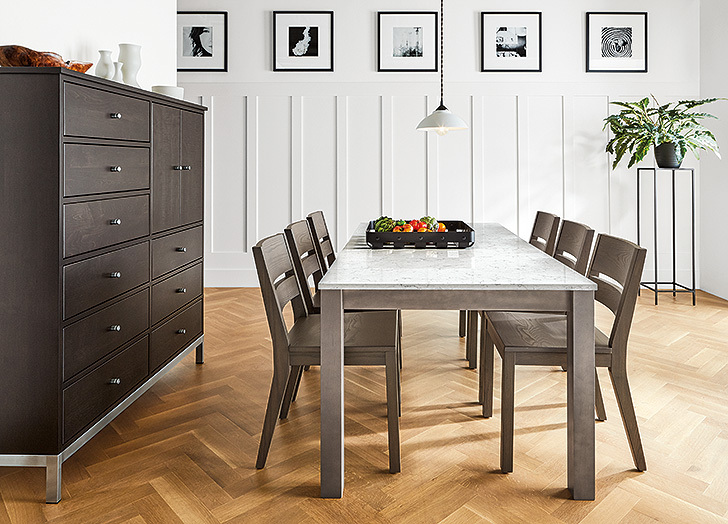 Afton dining chairs in our bark stain and the Linden dining table in our shell stain are close colors, but not an exact match, bringing a tied-together look without feeling prescribed. An organic, white quartz top acts as a neutral bridge between the two stains. The Linear cabinet, in a dark charcoal stain, provides an interesting contrast to this bright white room. A wall of black Profile frames and the Slim pedestal table in natural steel feel like purposeful pairs with their dark finishes, rounding out the room. Tip: There’s not always a need for a rug in the dining room. The hardwood floor keeps everything feeling clean and modern. 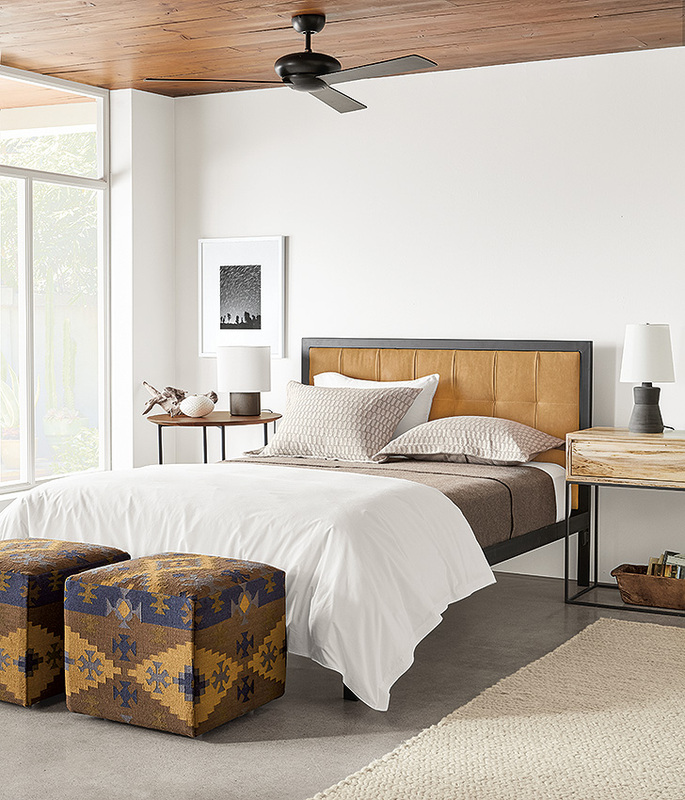 Leather, fabric, steel, wood and even concrete – we’ve got them all in this high-mix bedroom. Bedrooms are a great place to mix materials so it feels warm, textural and inviting. The camel leather headboard of the Chapman bed provides a neutral anchor for this space, and is accentuated by the dark, natural steel frame. Natural steel is mimicked by both nightstands, which are actually our Classic and Steen end tables. (Talk about mixing it up!) Neutral Sateen bedding and Cable rug add texture and depth without taking away from the bright, bold colors in the rest of the room. Tip: Two Indira square ottomans are a great way to mix in pattern and add function. Move them around as needed or keep them at the end of the bed for a unique statement. We love the tone on tone that comes through in different patterns in this bedroom. The blue-grey hues from the Avery bed, Horizon throw, Traffic pillow and Velvet pillow, Kavya bench and Gate rug give this room continuity, but a difference in patterns and textures keep it from feeling matchy-matchy. 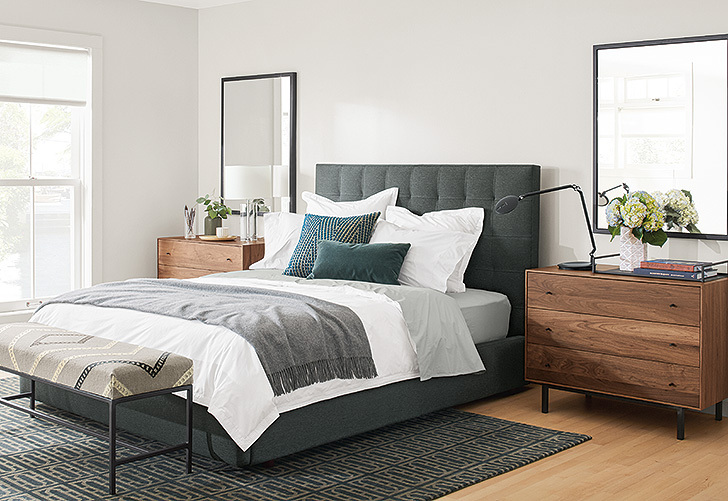 Matching Hudson dressers in walnut warm up the room, and Soho mirrors on either side make everything feel balanced. Tip: Symmetrical nightstands, mirrors and other accessories – like you see here – will stabilize even the most eclectic bedroom.